2019 promises to be an exciting year for Three Speeds! Whether you live in the Pacific Northwest or are somewhere else in the world, we’ve got some three speed fun for you! So mark your calendars (or just link to ours). Full details on these events will happen within the month or two before the event. But the dates have been set! April 1-30: Three Speed Adventure April (worldwide). Just like the past couple years, there are five separate challenges to complete: 1) Ride a three speed at least 15 mi/25 km 2) climb at least a 5% grade for 100 ft/30 m 3) unpaved/dirt for 1/2 mi/1 km 4) coffee outside 5) bike overnight. Registration will open up in March. Full details here. 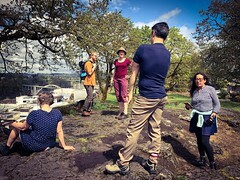 Sat April 20: Three Speed Day Tour (Portland). A 25 or 35 mile ride, mostly along bike paths, to Oregon City and back. Full details and how to register for the ride here. Come on down! 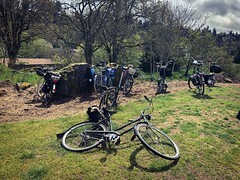 Wed June 5: Three Speed Evening Ride (Portland). Our annual Pedalpalooza ride, a 10 mile romp after work. This is our one “open” ride for the year, meaning any bike is welcome. Full details TBA. Sept 13-15: Willamette Valley Three Speed Tour (Portland). 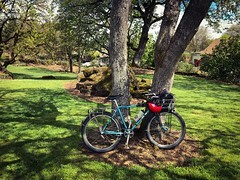 A multiple day ride southward using (mostly) the Willamette Valley Scenic Bikeway. This will be a self-supported camping tour. We’ll ride 35-50 miles a day and camp in campgrounds. Full details TBA. Sept 27-Nov 3: Three Speed October Challenge (worldwide). Ride your three speed at least three miles, three days a week, for three weeks. Registration opens in September. Full details here. 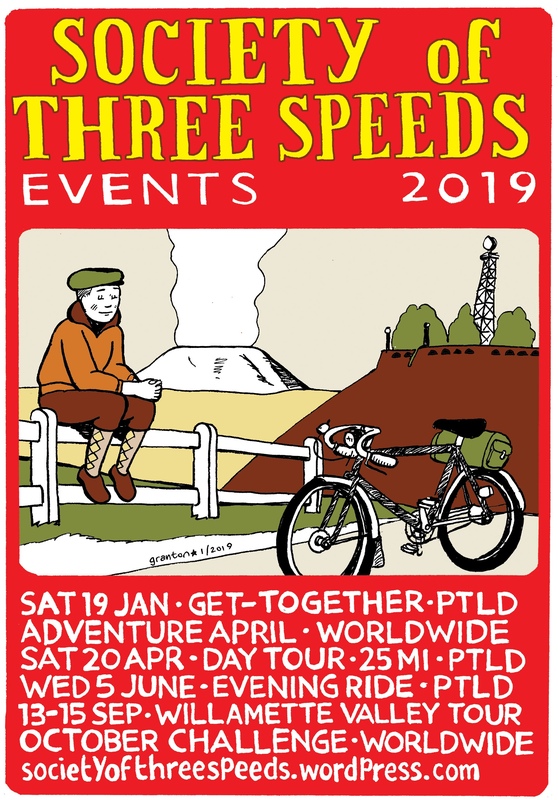 Oh yeah, that image above is a new Society of Three Speeds postcard! All members who have either purchased the new 2019 Membership Kit or those who are in Postcard Club will get one! Want in? Become a member or renew your membership! Buy it here.